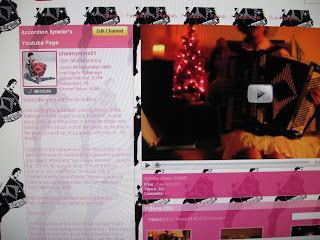 MISS NATASHA ENQUIST: ELECTRO-ACCORDION CHANTEUSE: 76 Subscribers! I randomly chose to celebrate that I have 76 subscribers to my Youtube page! I think this is quite impressive, and desperately need to update my page and put a new video up! And no, there weren't 20 "cheekyminx's" before me...it was a nickname I use online, and my birthday is November 21st, so it came together quickly from there, but I know, the username is somewhat ridiculous, but what internet persona isn't? Subscriber to my Youtube page! Happy New Year/ Trip to Vancouver!